I didn’t know something this gorgeous could come out of Lenovo’s manufacturing plants. 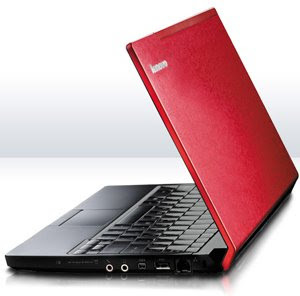 The Lenovo IdeaPad U110 is actually the first Lenovo laptop that I have drooled over, specially the red model. I don’t know but fiery red always gets my attention in ANY gadget. The Lenovo IdeaPad U110 is Lenovo’s entry into the ultraportable genre. It has an aluminum lid that comes in black or red and has a screen size of 11.1 inch and only weighs 2.5 pounds. Though I don’t have a soft spot for 11.1 inch laptops that costs around $1,800 specially since I could get a more powerful notebook for that price, the Lenovo IdeaPad U110 surprisingly performs well. The Lenovo IdeaPad U110 has a 1.6 GHz Intel Core 2 Duo processor which pretty much can perform a variety of task similar to its more bulkier counterparts. Because I don’t have a 20/20 vision and since I hate wearing glasses and contacts, I find screen sizes below 13 inch a little harder to use. Though the Lenovo IdeaPad U110’s screen has a 1366 x 768 native resolution, you will still feel the strain in your eyes during prolonged use. As for the keyboard, it’s very easy to use, almost similar to the bigger notebooks, maybe it’s because Lenovo used up all the space for the keyboard and left the touch pad way on the bottom, almost hard to reach. I recommend that you bring along a small optical mouse if you’re taking the Lenovo Ideapad U110 with you to the coffee shop. One downside is that Lenovo left out an optical drive for the IdeaPd U110 though it’s understandable considering that most ultraportables did away with optical drives. I love that Lenovo is shipping this laptop with two batteries. The four cell battery lasts around 1 and half hour while the seven cell battery can last up to three hours. The Lenovo IdeaPad U110 has the makings of a good ultra portable. For those willing to spend more than $1000 for a small laptop then they should consider the Lenovo IdeaPad U110. Yes, that really is quite something - and the cosmetics of it are rather good too, especially in that rather fetching red. That is definitely an item to be seen with.